Rep. Jerrold Nadler (D-NY), chair of the House Judiciary Committee, told the media Wednesday that the committee “must see everything” in Special Counsel Robert Mueller’s report, after authorizing a subpoena to the Department of Justice. “Everything” means every page of the nearly 400-page document, but it could eventually also mean what House Intelligence Committee chair Rep. Adam Schiff (D-CA) calls the “underlying evidence” that Mueller collected. Federal law bars the release of material presented to a grand jury, including testimony and evidence, to protect the rights of the accused. That is even more important in cases where the accused has been exonerated. The material a grand jury sees will inevitably contain some things that are damaging to the accused, or that would be damaging if made public. The investigative powers of law enforcement can dig up embarrassing secrets, even of the innocent. Democrats — and the media — want to see the full report because they continue to hold onto the irrational belief that the document itself will somehow refute the conclusion that Barr announced, quoting Mueller: “[T]he investigation did not establish that members of the Trump Campaign conspired or coordinated with the Russian government in its election interference activities.” In the ten days since, Mueller has said nothing to contradict Barr’s summary. Yet the “Collusion Truthers” cannot let go. The New York Times reported Wednesday evening that some staffers who worked on the Mueller report are frustrated because “the findings … were more troubling for President Trump than Mr. Barr indicated.” The motivation for the story is the fear that “Americans’ views will have hardened before the investigation’s conclusions become public,” even though those conclusions have already become public. Democrats argue that they are simply exercising their oversight functions, and their constitutional duty to hold the executive branch accountable. That is why they should see the Mueller report, and interview the officials who were responsible for it. But there was no need for them to see it by the arbitrary deadline of April 2 — Barr says it will be ready by mid-April — and there certainly is no need for them to see the “underlying evidence” in the investigation. 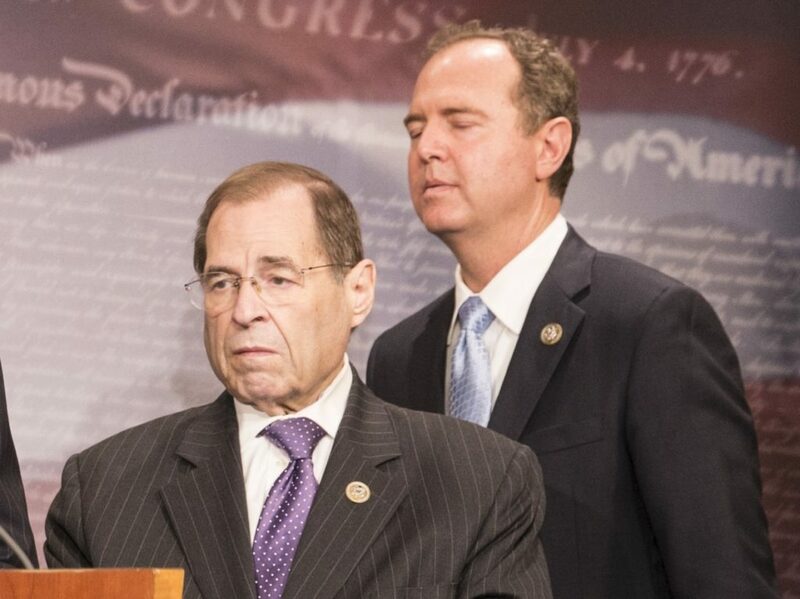 The reason Nadler, Schiff, and the Democrats want to see the “underlying evidence” is simple, and obvious: they want to bring any damaging details about Trump and his associates to light. There is no doubt that even if that information is handled behind closed doors in a classified briefing, it will be leaked, as such information has been leaked before. They are looking for opposition research to deploy against Trump in time for the 2020 campaign. That is not a legitimate oversight function of the House Judiciary Committee or the House Intelligence Committee. It would, in fact, turn Congress into an arm of Fusion GPS, the opposition research firm that the Hillary Clinton campaign and the Democratic National Committee hired in 2016 (through the Perkins Coie law firm, without disclosing the purpose of the expenditures to the Federal Elections Commission) to dig up dirt on candidate Trump. The Fusion GPS research, handled by former British spy Christopher Steele, relying on sources and information that might have come (ironically) from the Russian government, produced the infamous “Russia dossier,” which provided the flimsy justification for the FBI requesting permission to wiretap Trump associates during the 2016 campaign, and provided the salacious claims circulated by journalists and opponents before Trump took office. The entire fruitless inquiry started with the Democrats’ dirty opposition research campaign. Allowing the House Democrats to see what the FBI came up with — using investigative powers far more invasive and aggressive than anything Steele could muster — would, in effect, finish the work Fusion GPS started. Nadler and Schiff want to turn the House of Representatives into Fusion GPS. The Department of Justice, and the courts, should stop them. Previous articleHere we go… creepy PEDO Joe Biden is moving up the ranks of “big media” as a topic. This was last night on Joe Pags. YOU WON’T BE DISAPPOINTED.